Designed primarily for high end kitchens these L-shaped standing mats consist of four puzzle pieces. Two triangular pieces make the corner and then the left and right sides can be customized to any length. Four gorgeous “granite” colors are offered (copper, gold, onyx and steel) to fit in with the elegant decor of modern kitchens. EcoLast Home Line anti-fatigue mats make standing more comfortable by reducing back, neck, leg and foot fatigue from standing on hard kitchen floors. These special L-shaped mats come in 2-foot and 3-foot widths, and in lengths of 6 to 8 feet per side. Choose from four beautiful “granite” colors that will elegantly complement any kitchen, including Copper, Steel, Onyx and Gold. The granite pattern obscures dusty shoeprints and light dirt, while being as easy to clean as any kitchen floor. Made in the USA from 100% polyurethane, this mat provides comfortable, consistent support without compromising durability. 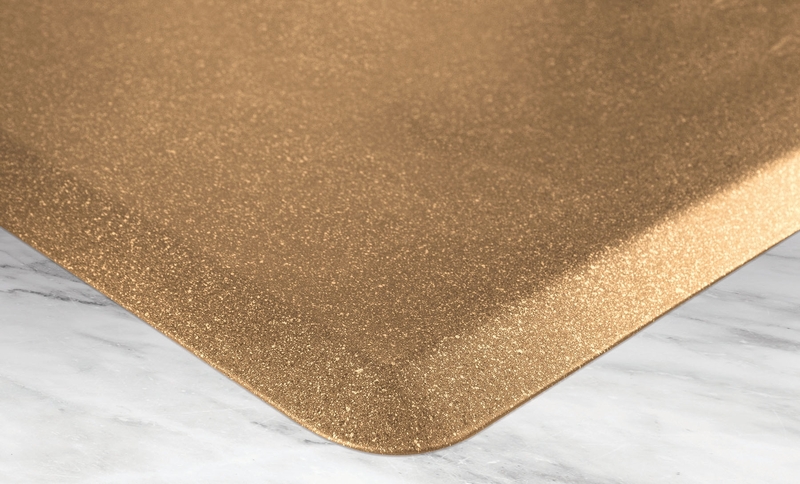 With a slip-resistant top surface and a non-skid bottom, the EcoLast mats are reliable and safe. 99.99% anti-microbial by design they are easy to clean and are resistant to stains, dirt and mold. EcoLast Puzzle-Piece L-Shaped Standing Mats enable you to create the perfect-sized anti-fatigue mat for any room, regardless of its shape or size. 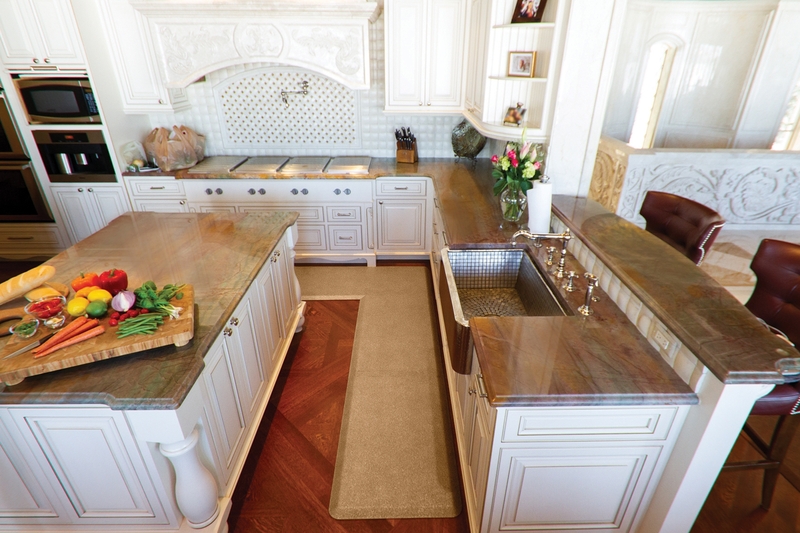 Turn a corner, surround an island in the kitchen, or extend a runner by combining different sections. Wherever you stand, you'll benefit from the cushioned layer of support that suspends your body weight and reduces stress and fatigue. 7.5' 7.5' 2' 0.75" 28.6 10" 20" 49"
This EcoLast mat features an industry-leading lifetime warranty against manufacturing defects and ten-year full-performance warranty. This guarantees that the product will provide consistent comfort, always lie flat, never delaminate, never compress, and never wear through. There is a lifetime warranty against manufacturing defects. Prices include free shipping to anywhere in the continental United States. Most standing mats are shipped via FedEx Ground. Larger orders and custom orders may be shipped by freight.